What will it cost me to hire a licensed electrical contractor? Often, homeowners and business owners, in an attempt to save money, will hire a handyman or an unlicensed electrician. However, they have not thought about the liability that they open themselves up to by doing so. 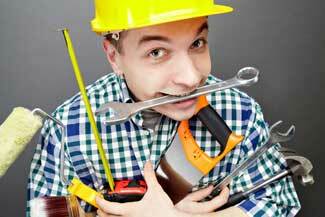 What if that handyman or unlicensed electrician is injured while working on your project? Do you know that he/she can sue you for medical bills and other losses due to the injury incurred? What if the work that is performed is faulty or fails within a month of being completed? Perhaps the hired worker leaves the job incomplete? What is your recourse? So while they may have cut costs upfront, in the long run they may come out of pocket for much more. What will it cost you, not to hire a licensed electrical contractor? Statistically, between the years ‘2007 and 2011 sixty three percent of home fires involved faulty or improperly installed wiring and related equipment’, reports the National Fire Protection Agency. Of those home fires, 50% of them resulted in the death of a resident of that home! The NFPA develops and publishes more than 300 consensus codes and standards to eliminate deaths, injury, and property loss associated fire, electrical, and other related hazards. If you hire a handyman or an unlicensed electrician to do electrical work on your home, they are more than likely not trained to do the work and are unaware of the NFPA codes and standards! In a western state, a customer received an estimate to upgrade his home from knob and tube wiring to for a complete electrical replacement to accommodate his needs. He felt that the licensed electricians estimate was too high! So he hired an unlicensed handyman to complete the job. The handyman completed the work, however, he never took out a permit through the county and a housing inspector was never called to approve the work completed. Unfortunately, since a housing inspector wasn’t called to review the work, the homeowner has no idea if the electrical work done to his home is safe or correctly wired. Also, when this homeowner attempts to sell his home, per state real estate disclosure laws, he will have to disclose that he had the home rewired without permits or inspections. Every licensed electrician will pay to have a permit pulled in the local jurisdiction. Once the work is completed, per the contract, then a city inspector will inspect the work. Giving the homeowner or business owner an added benefit that their property is correctly wired and safe! 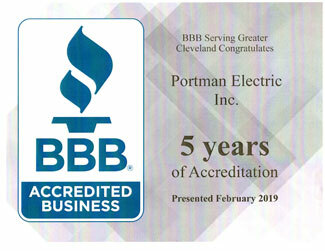 At Portman Electric, we have been providing our customers with the added benefit of 28 years of excellent service. We pride ourselves on making certain that as electrical contractors our commercial, residential, and industrial electricians are highly skilled and safety trained to deliver the best service to you. "The team was awesome! They showed up on time, did all the complicated wiring and installation work, cleaned up afterwards, hauled away the trash, and showed me everything I needed to know.""